Compressed air batteries have long promised truly clean energy storage, but they haven't scaled large enough in recent years to be viable companions to renewable power sources. That changes now that SustainX has switched on the first modern air battery large enough to join an electrical grid. 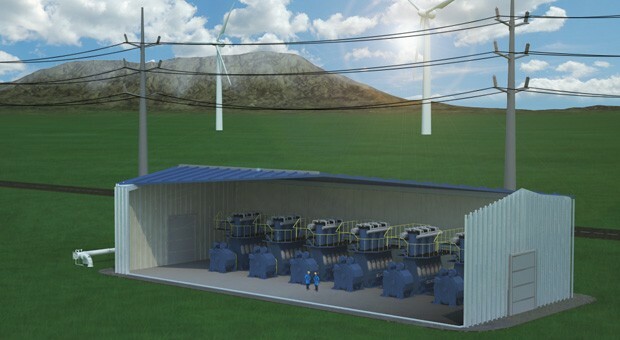 The company's new ICAES (Isothermal Compressed Air Energy Storage) system in Seabrook, New Hampshire can hold 1.5 megawatts of power versus the kilowatt-level capacities of its rivals. Despite its size, ICAES is sustainable; it doesn't require 'dirty' energy for either compression or releasing air to its generator, and the supply won't degrade like that of a chemical battery. The New Hampshire system is just a demonstrator to attract interest, but SustainX expects to have its first commercial battery running in China next year. If ICAES (and technology like it) proves successful, we could see more solar and wind farms that keep delivering electricity when they're otherwise idle.